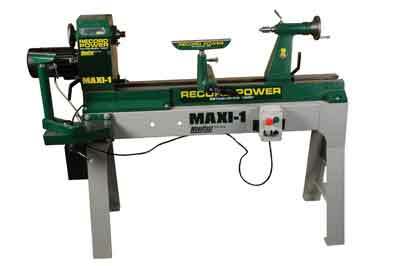 The Maxi-1 swivel-head lathe from Record Power originates from the Woodfast series of solidly-built lathes with a cast bed design. 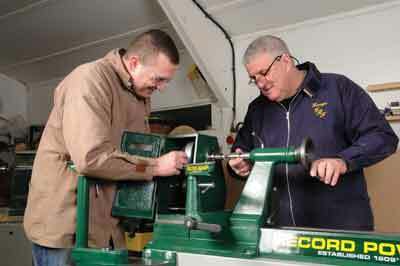 The lathe is powered by a 1.5hp motor which is controlled via an electronic variable speed control box, made by Schneider. This gives infinitely more speed via a six-stage pulley system from 90-3,850rpm, which works straight off a 13 amp standard home circuit. The pulley system is easily changed from the front by opening the door, which is held positively closed by an Allen screw so that the moving parts cannot be accessed while the machine is running. There is also a micro switch that stops the lathe if the door is opened. The lathe has a capacity of 950mm between centres and 520mm swing over the bed with 720mm maximum turning diameter on the outrigger - which can be purchased separately. My first task before I could use the lathe was to assemble the machine from the crate so that the whole process of the build and use could be assessed. The lathe came in a substantial wooden crate system, which gave me confidence that the machine could not be damaged in transit. All components were bolted down to give extra security. Firstly, the legs and cross struts were assembled. The legs being of solid cast metal and heavy in weight were bolted to the cross struts, which are made of thick pressed metal, using four bolts. It was easily assembled and very solid. The castings are well made and I noticed that there had been no compromise on the solidity of the parts, thus giving a very strong and solid base for the lathe. The legs also have holes for levelling bolts, which enable fine adjustment of the stand for uneven flooring. Or alternatively, the lathe can even be bolted to the floor. The bed, made of solid precision ground cast metal with the headstock already fixed, was easily bolted onto the base using six nuts and bolts. Due to the weight of the lathe - 209kgs - two people will be required for its assembly. The banjo and tailstock are also made of cast metal, which again are solid and well finished and easily slid onto the bed. The outrigger fitted to the side of the lathe easily and, again, I found this to be very solid indeed. The first test was to see how well the centres lined up. Being a swivel-head lathe there is a small amount of adjustment available; however, the centres lined up perfectly without any mismatch being encountered. The swivel-head works via a system that allows it to be moved to three separate positions. Within the head is a solid metal slot system, and with the easy use of a spring loaded pin the head is easily moved into position and locked positively into place by releasing the pin. The head is then locked solid with the use of a locking handle at the side of the headstock. There is a decent sized hand wheel that facilitates easy control of the 24-position indexing system. This is adjusted by the pulling out of a spring-loaded knurled pin, again being designed to be solid and positive. To test the working of the lathe I secured a 500mm (20in) x 100mm (4in) round piece of sweet chestnut (Castanea sativa) to a faceplate onto the lathe, bringing up the running centre for added security. The lathe was started and slowly turned up to around 500rpm, but the blank had a void and was therefore unbalanced. I expected some movement but there was nothing - just the quiet sound of the motor. Taking heavy cuts with a 12mm (1/2in) bowl gouge I balanced the blank with no loss of power from the motor, and I have to say that I had a smile on my face as it was solid and a pleasure to use. I roughed out the outside of the blank to the base shape of a platter before turning up the speed - again, no wobble - just solidity. The control box being moveable on the front of the lathe is secured easily in place using two cam levers, so standing out of the line of fire when starting up is not an issue. For over a year now I have been looking for a decent, solid lathe within my budget. Due to space and work considerations I favoured a swivel-head lathe, as a fixed-head within my price bracket would require me needing a footprint of ten feet in length to be able to hollow on the outboard position. But with the Maxi-1, due to its outrigger, I only need a 6ft space to be comfortable. There is much talk about manufacturing abroad and the quality thereof. I found the Maxi-1 to be as good as and even better in places than other machines I have looked at. It is very solid and powerful and ran quietly and smooth with ample power and control. I was so impressed with it that I purchased the demonstration model there and then and have been using it fully ever since. I have been over it with a fine-toothed comb and cannot find fault with its build or the running. It is certainly well engineered and finished. This machine punches well above its weight and performs very well. Having already tested various large capacity lathes within the Â£2,000-Â£3,500 bracket, I believe that the Maxi-1 is exemplary in terms of the versatility, capacity, solidity, control and the power it offers. Go and try one out - I guarantee that you will not be disappointed. I enjoy using it every time I press the button and its quiet running is an added bonus. I am so glad that I had the opportunity to test this machine as you get a lot for your money without having to make any compromises. The Maxi-1 was easy to put together, taking into account the need for two people. 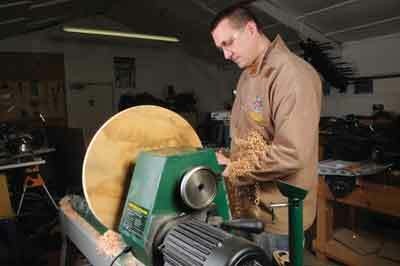 I like how solid the machine is and how easily the banjo and tailstock slide on the lathe bed. It is powerful, very stable, and is a solid machine for its price with a big capacity. I cannot find fault with the Maxi-1.